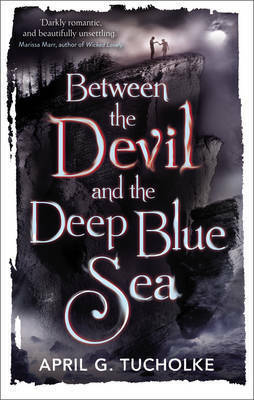 Today I have author April G Tucholke on the blog to share with us her top five UK inspirations for her novel Between the Devil and the Deep Blue Sea. Today is also release day for the novel so if you like what you see here, and my review, you should definitely go buy the book…. in fact even if you didn’t you like why you see you should buy it anyway because it is awesome! 2. The abandoned railroad tunnel behind Violet’s home, the one that supposedly hides Blue Hoffman and the monstrous children, is based on a real place. When I lived in Scotland I used to go for long hikes in the countryside south of Edinburgh. I’ve never been able to resist the road less traveled and I once walked down a neglected woodland path that dead-ended at an old train tunnel set into a hill. A person could walk right into the pitch-black tunnel and disappear into the thick gloom. Forever. God knows where that tunnel went. I only ever got three feet in. 3. Rebecca by Daphne du Maurier. “Last night I dreamt I went to Manderley again.” Manderley, the “secretive and silent” mansion on the sea, was an inspiration for Violet’s crumbling family estate, as was Thornfield Hall in Jane Eyre. 4. Jonathan Strange & Mr Norrell. One of my favorite books of all time. It influences everything I write. Clarke’s dry writ and incredible world building and dangerous, elusive magical elements had a monumental impact on my writing. September 23, 1954. Glasgow, Scotland. Hundreds of kids, age 4 to 14, start patrolling the city’s necropolis, armed with sharpened sticks and knives. The kids claim they are hunting a 7-foot tall vampire with iron teeth who has already kidnapped and eaten two boys. Parents become concerned and eventually the police have to be called in to break up the hunt. Here’s what drew me to this story: the one magnetic kid who told a lie about a vampire in the cemetery and made all the other kids believe him. Fascinating. Why did the kid do it? Where is he now? What kind of person did he grow up to be? Eventually these thoughts formed themselves into the kids-with-stakes, devil-hunting cemetery scene in my book. And the lying kid who started it all? That became the foundation of River.